A common debate among MOTHER/EarthBound fans is how the first two games connect, and in particular, how Ninten and Ness might connect. There are always lots of theories on how Ninten could be Ness’ father and stuff like that, and it usually gets people all riled up. The neatest one I’ve heard so far was this one, but I recently saw a line in the first game that got me wondering. 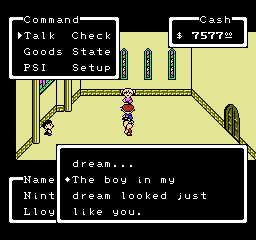 The line is essentially the same in the Japanese version; she doesn’t say that he IS the boy in her dream, just that Ninten looks like the boy in her dream or reminds her of the boy in her dream. So, although it’s a retroactive thing and probably wasn’t intentional, you could maybe argue that Ana’s dream was EarthBound, and that it was Ness she saw in her dream? It might explain why the worlds are so similar but still just different enough to be confounding. I dunno, it’s just a thought that popped into my mind that I thought theory people might like. I don’t really have any strong opinions or cares about theories one way or the other, I just enjoy seeing what fans come up with! I included a link to my personal theory in the website url field of this post, but I don’t think its a solution or anything, just something I came up with when I was bored one day. Boy, people are REALLY trying hard to give their fanfics some validation, aren’t they? I always like hearing the theories, but I think Mother was just the first try – then Mother 2 was the second try with better hardware available. Leaving no connection between the stories. The fandom will never stop until Word of God (in this case Itoi) says the truth. Regarding this little theory… nah, I don’t think so. I always thought the kid she meant was Ninten all along. That would be the most obvious thing. Oh! And about your choice as the best theory… It’s also a no-no for me. Too mean for a cheerful game series as this one. SuperTrainStationH, I actually like your theory quite a bit. I can’t think of any explicit thing that would invalidate it, and it fits nicely with the time-hopping shenanigans of both EB and M3. As regards to the theory itself: interesting, especially in light of Darrow’s take on their similarities causing a lot of confusion for Giygas too. My belief is that Ninten and Ness are actually the same person, but Ness is from an alternate timeline formed when Giygas, after his defeat in Mother 1, traveled back in time and started attacking from the past. Mother 2 already shows that Giygas altered the history of the world by doing things like planting the Mani Mani Statue underground, attacking the Ancient Scarabians, etc. Since Ninten and Ness are the same person, it explains why Giygas is attacking Ness for “revenge” in Mother 2. @mr. Tenda I like to think the same. I like to think ninten was a young version of ness, 8 maybe. And I think giygas attacked from the past so he could battle a younger weaker ness. To be fair really, I don’t know what to make of Ninten and Ness’s relationship. Originally, I did think that they were father and son, in this whole idea that all the main protagonists where descended from Maria and George, but looking at the timelines involved, there would have to be a LOT of retcons to make it work. Whilst I still like the Ninten+Ana=Ness theory (at least from a storytelling aspect), I wouldn’t see it as the absolute canon. Though I still like the idea that Ness is related to Maria and Ninten, in a distant cousin sorta way. Really, it’s anyone’s guess as to how the games are connected, but this dream theory…well, whilst I don’t really support it, it’s an interesting idea nonetheless. It might make sense in a way, if Ana has the ability of precognition. She could well be foreseeing the Chosen Four’s victory over Giygas in 199X. i thought that after giygas defeated ninten, he caused the whole story of mother [from ninten waking up from the sofa to the game resetting to the title screen at the end] to change into earthbound. and then after the ultimate defeat, it mass changed and porky was the only one to remember, but even he thought it was hundreds of years after earthbound and not a time swap. so the mother games are all just the repeat of a time loop. Personally I don’t put too much thought into it but I can see why people connect hte two. Mother 2’s tagline is the RETURN of Giygas afterall. I see Mother 1 to Mother 2 as Legend of Zelda to Link to the Past. I don’t think they were ever meant to be literally sequels. 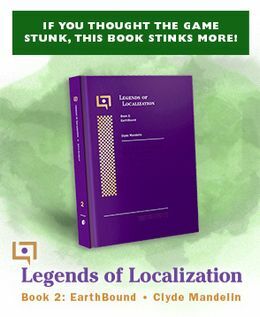 Although I would imagine if there were as many Mother games as Zelda games then Nintendo would have released a “Hyrule Historia” equivalent of Mother with a retroactive timeline. I don’t any fan who does this is wasting time though. People just enjoy different parts of a fandom, and speculation and theorizing is one of those things. It’s interesting to me that Mother 3 has what seem like red herrings to imply that it is in fact a Magicant. I’m referring to the Magypsies pink shelled houses and snowmen that look like they’re from Ness’ Magicant. But of course Mother 3 is directly connected to Mother 2 with Porkey. I’ve always wondered is what exactly is the sleeping Magicant dragon dreaming and if he is connected to the dragon in Mother 3. Earthbound IS a sequel, but there is no connection between the characters, is what I believe. But once someone makes up a rock solid connection theory, I’ll choose to believe, knowing it’s probably wrong. I personally believe that Ness & Co. were like a “new generation” of children that were tasked with thwarting a common enemy. I interpreted that person’s dialogue as foreshadowing the fact that Magicant was in fact Maria’s subconscious and that Queen Mary was Maria. The person who looked like Ninten could have been George (or Ninten, but I think the dialogue would have been like “Have I seen you before?”). That theory isn’t totally unbelievable, but a bit overly complex. Too much complexity can seriously hurt believability. I think that I will stick with the “Ninten is Ness’s dad” theory.